Coming off of a midweek performance of shambolic calamity in front of an international break it would be somewhat understandable if Arsenal provided an uneven or unfocused effort. For the first time in a very long time for an entire game we saw Arsene Wenger’s team deliver on all the statements of top quality, all the promises that we’ve only seen glimpses of, and all of the potential that his assembled team has to offer. The game itself was quickly decided by Arsenal within the first quarter of play. Alexis scored with a sumptuous backheel 6 minutes in followed only a minute later by a calm direct Ozil strike. At that point Manchester United was shell shocked and rightfully so. The Gunners continued to control the attack and a wonderful rocket strike from Alexis concluded the scoring only 20 minutes into the game. If the game was over the stress Arsenal applied on both ends. Petr Cech continually stymied United’s attack with either saves or just simply playing high level professional football. It was a dramatic departure from the midweek gaffes and it was a clear display of the gulf between Ospina and Cech. Combined with a strong defensive effort out of Mertesacker, Gabriel, Bellerin, and Monreal it was clear that Martial wouldn’t have the type of the runs that he has been receiving to much aplomb since arriving at Old Trafford. 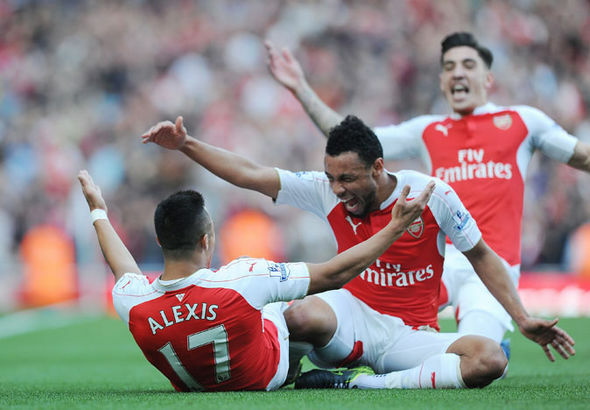 Francis Coquelin was very much back to the top of his game. In particular Juan Mata was held silent – to the point where when he was subbed off you could be forgiven for not knowing his was on the pitch. All told the defensive effort was spectacular and when there were openings the keeper was excellent. In the middle Aaron Ramsey and Santi Cazorla did a solid job of providing a link from back to front. Both had efforts on net that they failed to convert but their level of play in ensuring Manchester United couldn’t break out and that Arsenal could meant we had total impunity to run the pitch as we saw fit. Both have had high and low points throughout the year but they’ve been two of our more consistent players and they maintained that function. Nothing spectacular but they both did their jobs well. Up front Theo Walcott teased breaking free all day and although he didn’t manage to get on the sheet he did provided assists on 2 of the 3 goals. His motion and playmaking were solid throughout the game. If you want to give Theo a knock it remains that when a shot requires pace he comes up lacking. It just isn’t a figment of his game and for a true CF it is a necessary tool. Meszut Ozil seems mercurial at times in that you’re not always sure if he feels the team around him knows what he’s thinking and it seems to grind him a bit as he watches brilliant passes to the ghost he sees in the back of his mind. On Sunday that Ozil was nowhere to be seen as seemingly every ball he played found a teammate in the exact right spot. This was a different Ozil then what we’ve seen so far and it was very much a welcome sight. Finally Alexis put in 2 goals of world class quality showing again that when Wenger does open the books he actually does quite a good job of balancing value and talent. On Sunday every press conference we’ve heard for the last 10 years about the team’s spirit, about the world class talent, about the development and work that goes into each game sounded entirely accurate. If this is the Arsenal team we see for the rest of the season every team goal remains up for grabs. Few teams in England, Europe, or anywhere can contend with the level of masterwork that Arsenal put in.